Ships M-F, generally within 24 hours. This clean, comfortable and simply designed Alder Sauna Stool is ideal for anyone who enjoys the majority of their sauna therapy sessions from home. Constructed entirely of alder wood, the seat of this stool is additionally painted with a 100% non-toxic milk paint. The milk paint seals and protects the wood seat surface from sweat and moisture, making it ideal for use with the Sauna Fix near infrared sauna or other home sauna types. If you sauna by hanging a near infrared sauna lamp inside of a shower or bath tub, this sturdy, four-legged stool provides stable seating when placed inside. It is also small and lightweight enough for use as additional or corner seating inside of traditional, far infrared or wooden home saunas. 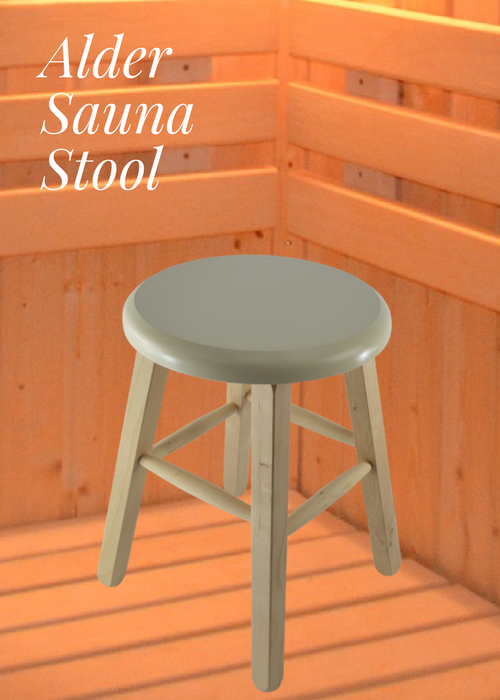 This affordable alder sauna stool option does require some assembly, and includes easy-to-read instructions to make the process as simple as possible. Once assembled, the stool will not break down. It is intended for permanent long-term use with indoor home saunas. If you would like a portable sauna stool that is convenient for travel, with the ability to quickly assemble and disassemble, take a look at our portable Sauna Poplar Wood Stool, which includes a travel and/or storage bag. This Alder Sauna Stool measures 18 inches tall, with a seat diameter of 12.75 inches. Both alder and poplar are the highest quality and safest wood choices for use during near infrared or home sauna therapy sessions.